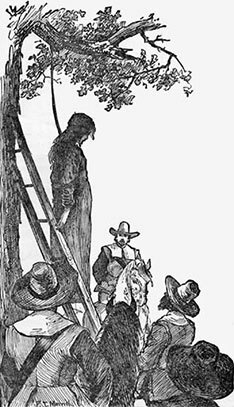 In 1642 witchcraft was punishable by death in Connecticut. This capital offense was backed by references to the Bible, i.e., Ex: 22, 18; Lev: 20, 27; Deu: 18, 10, 11. Alse Young (sometimes also referred to as Achsah or Alice) of Windsor, Connecticut was the first person executed for witchcraft in America. Alse was hanged at Meeting House Square in Hartford on what is now the site of the Old State House. A journal of then Massachusetts Governor John Winthrop states that "One of Windsor was hanged." The second town clerk of Windsor, Matthew Grant also confirms the execution with the May 26, 1647 diary entry, "Alse Young was hanged." Although Connecticut may not have experienced the same level of hysteria as Salem Massachusetts, Alse Young was not the last person hanged for witchcraft. Mary Johnson of Wethersfield was executed in 1648 after having confessed to entering into a compact with the devil. Joan and John Carrington also of Wethersfield were executed in 1651. Rebecca and Nathaniel Greensmith and Mary Barnes were found guilty of witchcraft and were hanged in Hartford on January 25, 1663. Ann Cole had accused Rebecca Greensmith of making her have strange fits. Witchcraft was last listed as a capital crime in 1715. The crime of witchcraft disappeared from the list of capital crimes when the laws were next printed in 1750. George Lincoln Burr, editor, "Narratives of the Witchcraft Cases 1648-1706"
David D. Hall, editor, "Witch-Hunting in Seventeenth Century New England"